More recently, we are seeing them invade a variety of other species and killing them at an alarming rate. The PSHB bores into the tree and then infects it with a fungal pathogen which eventually kills the tree in as short as 3 months. May lead to water stress and potential decline, secondary insect/pathogen attack, twig dieback. wood leading to whole branch/tree failure. WHAT IS A Reproductive Host Tree? A tree where fungi successfully develop within that host tree. 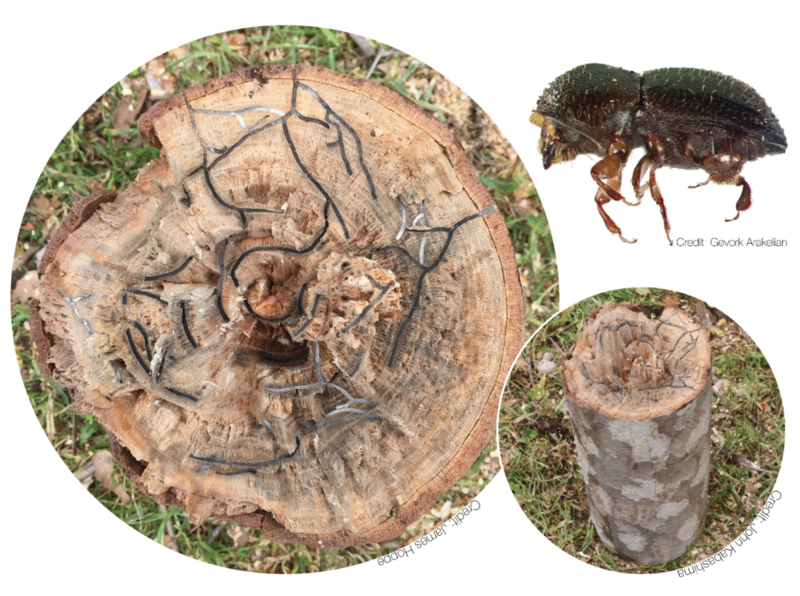 When this fungi is suitable for growing, the female beetle remains in the tree and reproduces (up to 6 generations = up to 64M insects). Soil moisture and condition is necessary for uptake of the treatment within the tree. Particularly for conifer trees. Industry based research indicated 85% control, however field observations have been unable to verify this efficacy. When pruning trees, use hand saws when possible and sterilize the tools to prevent the spread of the pathogen. Ideally, between each cut. Chain saws cannot be sterilized effectively. When removing entire tree, grind stump and surface anchor roots. Do no move/transport large intact parts of the tree off the site. If must be taken off-site, must be covered to ensure beetles are contained.